This entry was posted on March 13, 2008 at 8:53 am and is filed under Caregiver Truths, Caregiving Lessons, The Possibilities. You can follow any responses to this entry through the RSS 2.0 feed. You can leave a response, or trackback from your own site. This is a beautiful post that reminds me of how slow I needed to be with my mother. You don’t hurry someone with Parkinson’s. You don’t hurry someone with Alzheimers. Mother had both. She was in many ways, like my children were at two and three. Something would interest her and she’d stop, slowly pick it up, examining all sides. Our rush to medicate and overmedicate, hospitals, tests, therapies…it’s all too much. Too much stimulus, too many choices. It’s natural. Our bodies slow down. Brains, slow down. Thoughts slow down. Learning to calm myself took practice, and although I found myself racing on the inside, I’d catch myself and breathe. 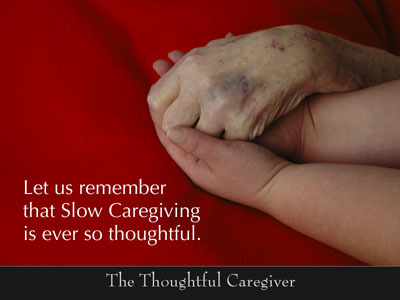 I like this concept of Slow Caregiving.